In Canada, they definitely love their rocks. Not only are there rocks in the hillside, and practically every direction you turn… but the people who live there have found ways to put all those rocks to good use. They’re used as signs. As memorials. And as really cool statues. In fact, you don’t see much “graffiti” in Canada. Instead, you see rocks used to spell out various messages along roads and hillsides. It’s quite interesting. I first saw one on the side of the road — in front of a country farm house. Next to it was a sign that read: CANADA ROCKS! Then, I spotted that same unique shape of rocks in the form of “art” atop someone’s desk in Alberta. We asked our server what the pictures were of and she said it was an Inukshuk and that it was a symbol of hope from the Inuit people. She added, it’s also the chosen symbol of the Vancouver 2010 Olympics. So, from that point on we looked high and low for the perfect Inukshuk. We found several made from crystalized rocks and stones. But I wanted more of a rustic-looking one. I wanted actual rough-edged rocks (…imagining that they were the remnants of actual boulders found in and around Canada). Lo and behold, we return to the States and I’m in Target walking past some 16×20 posters on sale. 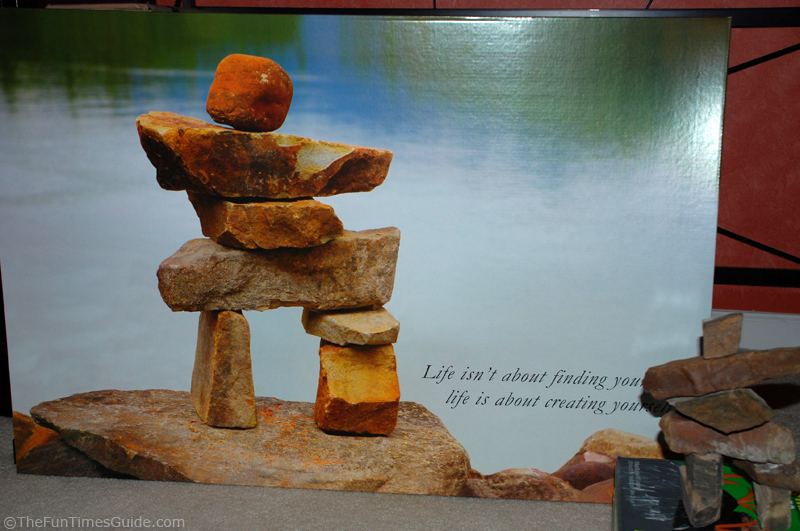 What is on top of the stack?… An Inukshuk! Yep, right here in little ‘ol Franklin, Tennessee. Well, I guess Tennessee ROCKS, too!! I’ve since learned that there are several different shapes and colors of rocks that can be used in the formation of an Inukshuk (…also spelled inuksuk, inukhuk, or inuksuit and pronounced ee-nook-shook or ee-nook-sook). However, there are some that tend to resemble a human shape more than others. Turns out, the poster I found in the States was of this “non-original” formation. It looks similar to a person “surfing” on a big boulder. So I thought I’d do the next best thing… try and build my own! It’s easier said than done, because rocks are so varied in shape and they don’t always line up and stack neatly on top of one another. 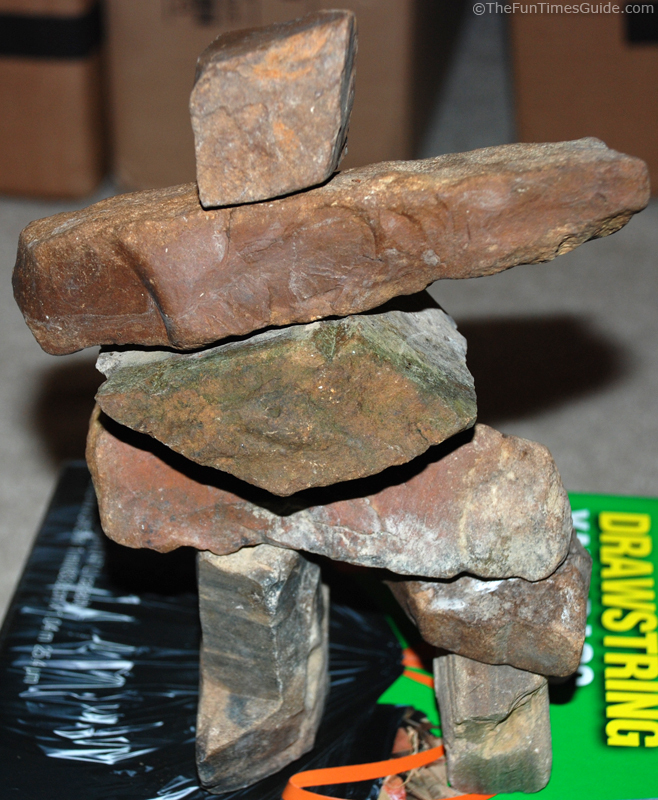 Nevertheless, I managed to come up with some semblance of an Inukshuk using rocks from Tennessee. I know… mine kind of looks more like the human version than the classic Inukshuk shape. And I still need to secure it to a larger rock as a base on the bottom. But I like it because it’s unique and mine. I actually took a picture of the Inukshuk poster and made it the screensaver on my cellphone! The blue sky background really enhances the dimension of the rocks.